The Shōgun (将軍, Japanese: [ɕoːɡɯɴ] ( listen); English: /ˈʃoʊɡʌn/ SHOH-gun) was the military dictator of Japan during the period from 1185 to 1868 (with exceptions). The shogunate (English: /ˈʃoʊɡəneɪt/ SHOH-gə-nayt) was their administration or government. In most of this period, the shōguns were the de facto rulers of the country, although nominally they were appointed by the Emperor as a ceremonial formality. The shōguns held almost absolute power over territories through military means. Nevertheless, an unusual situation occurred in the Kamakura period (1199–1333) upon the death of the first shōgun, whereby the Hōjō clan's hereditary titles of shikken (1199–1256) and tokusō (1256–1333) dominated the shogunate as dictatorial positions, collectively known as the Regent Rule (執権政治). The shōguns during this 134-year period met the same fate as the Emperor and were reduced to figurehead status until a coup d'état in 1333, when the shōgun was restored to power in the name of the Emperor. 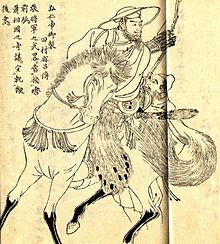 Shōgun is the short form of Sei-i Taishōgun (征夷大将軍, "Commander-in-Chief of the Expeditionary Force Against the Barbarians"), the individual governing the country at various times in the history of Japan, ending when Tokugawa Yoshinobu relinquished the office to Emperor Meiji in 1867. The tent symbolized the field commander but also denoted that such an office was meant to be temporary. 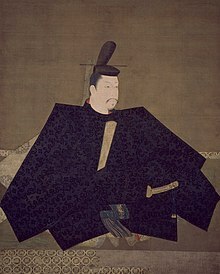 The shōgun's officials were collectively the bakufu, and were those who carried out the actual duties of administration, while the imperial court retained only nominal authority. In this context, the office of the shōgun had a status equivalent to that of a viceroy or governor-general, but in reality, shōguns dictated orders to everyone including the reigning Emperor. In contemporary terms, the role of the shōgun was roughly equivalent to that of a generalissimo. Originally, the title of Sei-i Taishōgun ("Commander-in-Chief of the Expeditionary Force Against the Barbarians") was given to military commanders during the early Heian period for the duration of military campaigns against the Emishi, who resisted the governance of the Kyoto-based imperial court. Ōtomo no Otomaro was the first Sei-i Taishōgun. The most famous of these shōguns was Sakanoue no Tamuramaro. In the early 11th century, daimyō protected by samurai came to dominate internal Japanese politics. Two of the most powerful families – the Taira and Minamoto – fought for control over the declining imperial court. The Taira family seized control from 1160 to 1185, but was defeated by the Minamoto in the Battle of Dan-no-ura. Minamoto no Yoritomo seized power from the central government and aristocracy and established a feudal system based in Kamakura in which the private military, the samurai, gained some political powers while the Emperor and the aristocracy remained the de jure rulers. In 1192, Yoritomo was awarded the title of Sei-i Taishōgun by the Emperor and the political system he developed with a succession of shōguns as the head became known as a shogunate. Yoritomo's wife's family, the Hōjō, seized power from the Kamakura shōguns. When Yoritomo's sons and heirs were assassinated, the shōgun himself became a hereditary figurehead. Real power rested with the Hōjō regents. The Kamakura shogunate lasted for almost 150 years, from 1192 to 1333.